For many of us, our first real exposure of Attila My Honey was during the prog/psych-rock Vision Festival at Jive, September 2015. That performance in itself pitched a couple of questions; one, this high school band possessed an incredible amount of raw talent, and two being why the f**k were they playing at midday (however perfectly reasonable given the lineup included the likes of West Theb, Druid Fluids and Glass Skies). After spending much of the first five minutes in the interview debating the benefits of Farmer’s Union Iced Coffee, we got stuck into the nuts and bolts. Mainly the band’s debut album Soft Left, their first cohesive work after last years’ Wahoo collection. After spending their first real year as a band completing their ATARs, this coming year the band has the very real opportunity to push the project as far as their talents will take it. Frank: I think we had a more unifying concept for [Soft Left]. I had this revelation that all that really matters in pop music is the song (itself), so we simply set out to write really good songs and let it show in the recording. Brett: So you didn’t try to write good songs in your last EP? Matt: The last EP I think isn’t really an EP, we were all pretty heavily (involved) in school and Frank kind of did the last one by himself at different times so drum tracks were at times set out months before and that’s why it does sound pretty patchy. In our opinion this is our first release as a band. Ella: I feel like it was a combination of all different songs that we had done here and there and now this one is more fitted together. 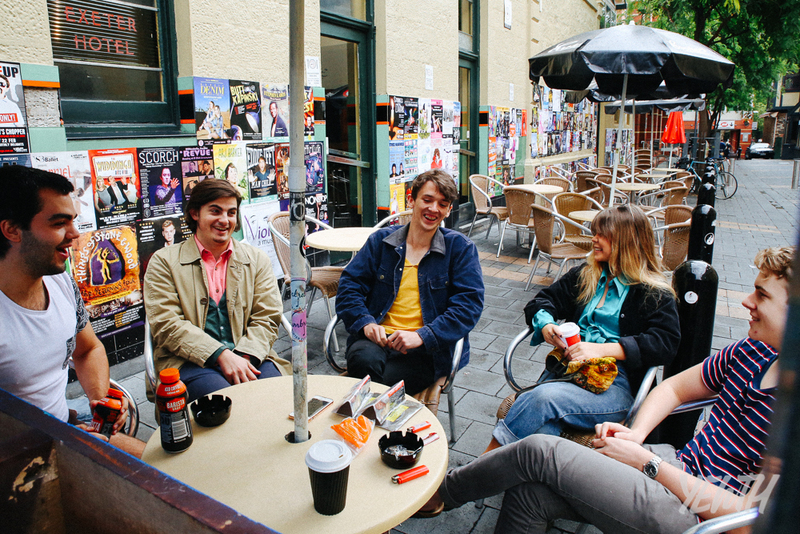 Taking a unusual approach to their release, the band has uploaded Soft Left to Spotify to gauge the initial response, the vast majority residing in Adelaide, while concurrently ramping up their live presence now that they have the time to do so. Adelaideans can expect strong elements of Fleetwood Mac, with plenty of influence coming from the Grammy Award winning Rumours album. Matt: I just really want to get a good cohesive live sound at the moment. Being in a band and completing Year 12 is hard because we were only getting together about two weeks out (from a show). However, this year we have a couple coming up so it should be good. Frank: There’s a bit of tenderness in the record, it’s definitely a bit moody. I feel as though there isn’t a lot of tenderness going on in the world right now, so that’s what we wanted to do. Though minimal time was spent gigging around in the last twelve months, the band has taken every opportunity to absorb as much as they can from every experience. Whether it be playing alongside more established bands, or heading to shows and soaking up the atmosphere of a powerful live presence, they have taken in as much as the can while still learning and working on their craft. Ella: The first thing is whenever we are playing with other bands, we always try to stick around and see what they do differently to us, how they use the same venue differently to us. That’s one of the good things about the small Adelaide scene is that you can be quite involved with plenty of things. Matt: The whole Swirl Records thing. We have quite a few mates involved with plenty of different bands, so we do try to get out and see their shows and learn from what they’re doing. Maybe perhaps I’m not getting out enough and really seeing bands that I should’ve seen before. Ella: When you get somebody commenting on your Facebook posts saying something like “Come To Madrid!” then we’ll know we’ve made it. Check out Attila My Honey on Facebook and see them at the Producers Bar on March 25 here. Soft Left is available on Spotify and a host of other online sites.